If you’ve ever been in a pinch to buy flowers and thought about making a last-minute purchase at the grocery store, this guide is for you. Usually, the best quality flowers, and the cheapest, are not the ones found at the supermarket. But, sometimes, in a crunch, these are the only ones that are available and we realize this. If you ever need to buy last-second flowers at the market, consider choosing bouquets and arrangements from a natural foods market like Whole Foods or Sprouts. Flowers sold there are often the freshest and they’re sometimes grown without dangerous pesticides, which we appreciate. In case you do find yourself having to buy flowers at a conventional grocery store, however, you can follow this guide to make sure you’re getting the best quality flowers (for the best price) that you can. Sometimes, the flowers that you have to choose from at the market are not the best ones. They’re often generic mixes that are thrown quickly together, without much thought. To give the flowers you actually want to give, and not pay for ones you’re not absolutely thrilled with, you can do a couple of things. 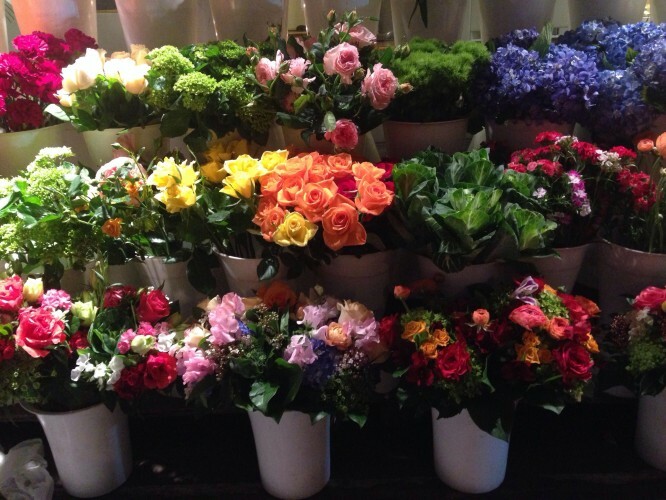 You can purchase a bouquet that offers the most kinds of flowers you like, and pick out any that you don’t love. Or, you can opt for single blooms of your favorite flower (even if it’s just one) that will make more of an impact than a random bunch. The point is, you don’t want to spend money on flowers you don’t feel good about giving. Amidst the myriad of grocery store blooms, again, go for something you love even when in a crunch. At a market’s worst, there’s usually at least one flower that will catch your eye. As you stand there among a somewhat pointless display sometimes, what does your eye gravitate toward? Roses? Gerbera daisies? An orchid? Choose flowers that strike you in some way and you should be fine with your gift. When you’re buying flowers at the supermarket, it’s okay to feel each bunch to gauge freshness. Look for signs of wilting or dying, such as limp stems and petals. Check to see if bouquets contain any brown flowers, and smell for the flowers’ aroma. While you’re at it, look down deep inside the floral bunches to uncover any slimy stems that might signify you should pass on that particular flower arrangement. Giving a gift like flowers requires that your whole heart be in it. It means so much more to a person (and we think they will surely be able to tell) when you offer a thoughtful gift or just a flower or two (or only a simple sincere expression of your thoughts in person or on a card) than to grab any old flowers off a rack just because. As long as you feel good about what you give, your giftee will surely be able to also feel your love. If you’ve ever been in a pinch to buy flowers and thought about making a last-minute purchase at the grocery store, this guide is for you. Usually, the best quality flowers, and the cheapest, are not the ones found at the supermarket. But, sometimes, in a crunch, these are the only ones that are available and we realize this.If you ever need to buy last-second flowers at the market, consider choosing bouquets and arrangements from a natural foods market like Whole Foods or Sprouts. Flowers sold there are often the freshest and they’re sometimes grown without dangerous pesticides, which we appreciate.